Overwhelming. It’s the word most commonly used to describe the destruction left by Hurricane Michael—the biggest storm on record to hit the Florida panhandle—in Panama City, Mexico Beach and regions further east. Like most people who live or own property along the Emerald Coast, The Premier Property Group (PPG) family felt a deep loss for our neighbors as well as a strong desire to help them rebuild. Contributions have ranged from toy drives, work teams, monetary donations and more, but few have demonstrated the kind of continued perseverance to bringing hope back to these regions as PPG Realtor Michael Tounge. It’s one of the many reasons he was the recipient of the PPG Life Award this past December. Like many PPG agents, Michael took action from day one, reaching out to people in emergency situations. He recalls cutting one person’s car out from under a garage to give them access to transportation. In another instance, he remembers helping two young teenage girls—both carrying a load of supplies—find their home, which was nine miles from where his team found them. 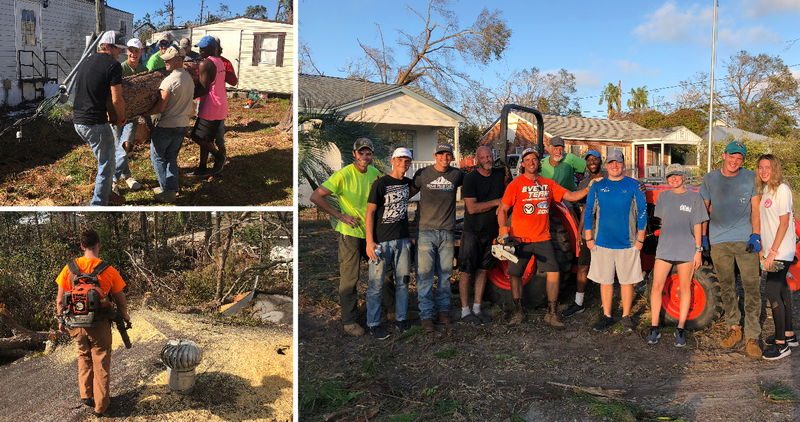 In the months following the storm, Michael engaged the help of students from a Bible Study group he attends, taking 23 young people out on numerous occasions to complete debris clean up. He joined the efforts of the Sonder Project, a group based out of Walton County that works to help communities get back on their feet, and partnered with Country Music Duo – Florida Georgia Line to fund projects. The organization raised approximately $500,000 for Hurricane Michael relief, and funds have been set aside to rebuild three homes, repair roofs and renovate. That commitment continues today. While Michael has scaled back his time in the region to about once a week, he continues to volunteer with the Sonder Project at a time when many are beginning to forget that tremendous help is still needed. Donate your time wisely by working with an organization that has planned volunteer days and vetted projects. Don’t make blind purchases such as bulk toilet paper or canned goods. Many companies are supplying these kinds of items now, and the money would be better used as a donation through an trusted organization providing relief.